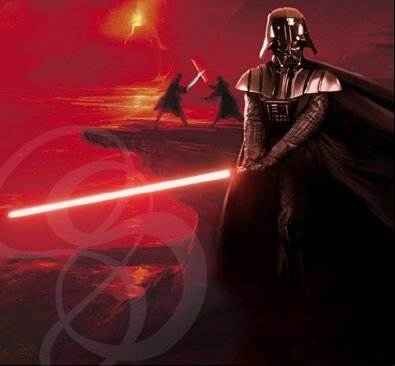 Darth Vader/Annakin Skywalker was the king of misplaced lightsabers. "If your hands weren’t attached, you’d lose those too," his old master used to tell him. Oh wait.. In all, Darth Vader/Anakin Skywalker went through five, count ‘em, Five different lightsabers in his illustrious Jedi career. His first was given up when he turned to the dark side, and then lost forever when he hacked his son’s hand off on Cloud City(his son, (you might know him, a boy named Luke) was holding the lightsaber at the time). Interestingly, there are reports of a cloud city maintenance man having been killed at around the same time while doing work at the base of Cloud City. Oddly, it appeared that he had been chopped in two by an energy source traveling at an enormous rate of speed. Go figure. This particular lightsaber is Vader’s third, and was featured throughout The Empire Strikes Back. No one really knows what happened to his second (his first sith saber). His third was lost in round two of the domestic abuse pattern between father and son. Vader loses this one too before the next film, Return of the Jedi, but he does have some pretty cool fight scenes with this one, and it, of all his sabers, seems to embody him best of all. As far as the history goes, if you don't know, then I fear it's hopeless. Go rent some movies. Oh alright, I'll try. Lightsabers are the chosen weapon of the Jedi, a powerful order of knights in the six Star Wars movies created by George Lucas.